1995.050.01 has the duller AY3 fluor when compared with 1994.050.01. 1996.050.01 has a white back. 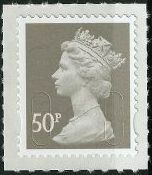 2006.050.01 is only available from the Victoria Cross Prestige Book (DX37) - the head is closer to the left frame than 1996.050.01. 2003.050.01 and 2003.050.02 have bluish gum, whilst 2005.050.01 has creamy gum. 2005.050.02 is only available from the Trafalgar Prestige Book (DX35). 2009.050.01 is only available from the British Design Classics (I) Prestige Book (DX44) and is a completely different shade from 2007.050.01. 2009.050.02 is self-adhesive with security slits. 2010.050.01 is self-adhesive with Type 3 security slits. and codes "MPIL" and "MA10". Printed Sideways Left. 2010.050.02 is self-adhesive with Type 2a security slits. and codes "MPIL" and "MA10". Printed Sideways Left. 2010.050.01 - 03 originate from George V Accession Prestige Book (DX50) but 2010.050.03 is only known to exist used on official FDCs. 2011.050.01 is self-adhesive with Type 2 security slits. and codes "MPIL" and "M11L". Printed Inverted. 2011.050.01 - 02 originate from William Morris Prestige Book (DX52) but 2011.050.02 is only known to exist used on official FDCs. 540.2 is only available from the British Army Uniforms Prestige Book (DX40). 540.3 has Inset Bands at thr Right (IR) is only available from the British Army Uniforms Prestige Book (DX40). 2010.054.01 originates from the Classic Albums Prestige Book (DX48). The first recorded usage of the Garamond typeface for the "54" (known as "Type 2"). 2010.054.02 originates from the 350th Anniversary of the Royal Society Prestige Book (DX49). The only other recorded usage of the Garamond typeface for the "54" (known as "Type 2"). 1994 and 1995 issues are Yellow Fluor (AY), 1996 issues are Blue Fluor (AB). 1994.060.01 is the generic number regardless of the booklet source (GQ1 or GQ2). 1994.060.01a has one 3mm Inset Band at Left in postions 1 and 3 from book of 4 - GQ1 issued 9th August 1994. 1994.060.01b has one 3mm Inset Band at Left in postions 1 and 3 from book of 4 - GQ2 issued 4th October 1994. 1994.060.02 has one 3mm Inset Band at Right in postions 2 and 4 from book of 4 - GQ1. 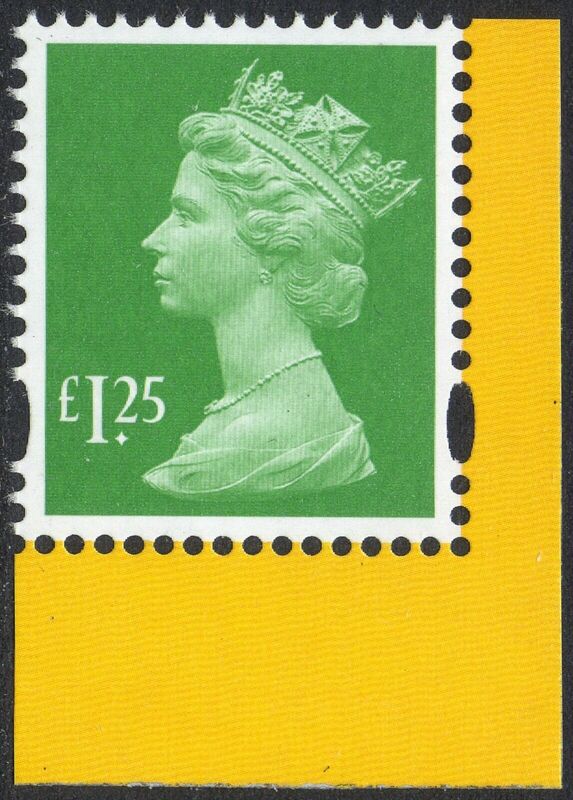 1996.060.01 has one 3mm Inset Band at Left in postions 1 and 3 from book of 4 - GQ4 issued 19th March 1996. 1996.060.02 has one 3mm Inset Band at Right in postions 2 and 4 from book of 4 - GQ4. 2010.060.02 is only available from the London 2010 Miniature Sheet. 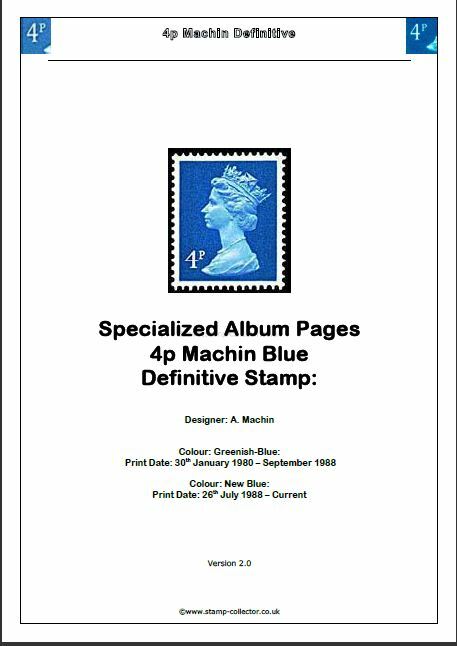 2010.060.03 is only available from the Britain Alone Prestige Book (DX51). 2009.062.02 originates from Treasures of the Archive Prestige Book (DX46) and has a pale head. 2010.062.01 originates from Classic Albums Prestige Book (DX48) and is a deeper shade. The Harrison printing has a thinner value than the Enschedé version which also has weaker phosphor bands and a white back. 1996.063.02 has 11.5mm between the phosphor bands. SG doesn't differentiate between 1996.063.03 and 1996.063.04. (the former has a narrow left bar and the latter a narrow right bar. Overall they both have a 12.5mm gap between the phosphor bands. 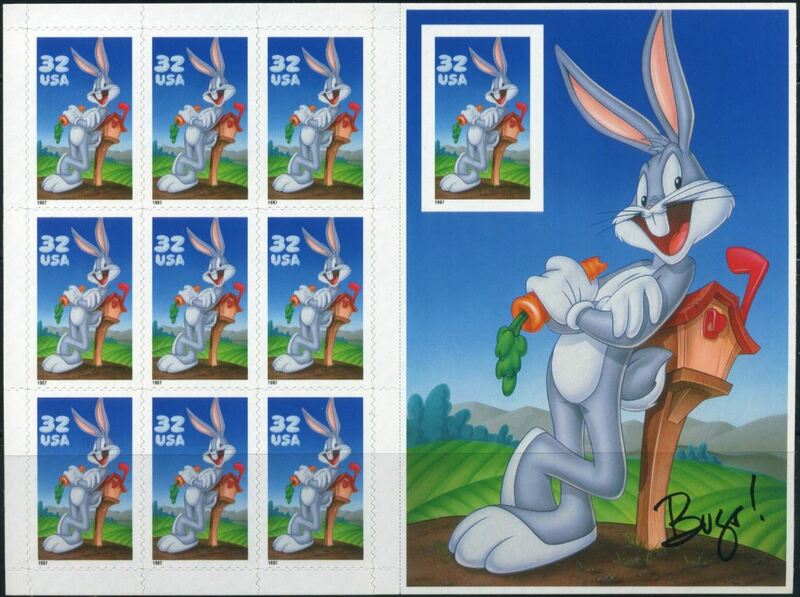 1997.063.02 is the generic number regardless of the booklet source. 1997.063.02a is from the Book of 4 - GR3 issued 26th August 1997. 1998.063.01 is from the Book of 4 - GR4 issued 05th May 1998. 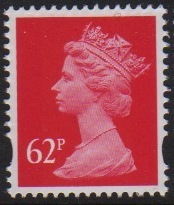 1996.063.05 has one 3mm Inset Band at Left in postions 1 and 3 and is the generic number regardless of the booklet source. 1996.063.05a has one 3mm Inset Band at Left in postions 1 and 3 is from the Book of 4 - GR1 issued 8th July 1996. 1997.063.03 has one 3mm Inset Band at Left in postions 1 and 3 is from the Book of 4 - GR2 issued 4th February 1997. 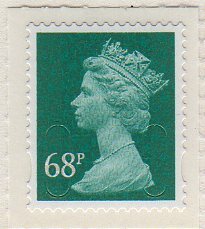 1996.063.06 has one 3mm Inset Band at Right in postions 2 and 4 and is the generic number regardless of the booklet source. 1996.063.06a has one 3mm Inset Band at Right in postions 2 and 4 is from the Book of 4 - GR1. 1997.063.04 has one 3mm Inset Band at Right in postions 2 and 4 is from the Book of 4 - GR2. 640.2 is only available from the Booklets of 4 (GS1). 2000.065.02 is from the Book of 4 - GT1 issued on 27th April 2000. 2010.067.02 originates from the London 2010 Miniature Sheet. Bands fluoresce Yellow. 2011.067.01 originates from the WWF Prestige Book (DX51). 2002.068.01 rreacts to short-wave ultra-violet, whereas 680.2 reacts to long-wave. Although 2003.068.01 is from the "Byfleet" series it is only known on Intermediate paper (TRI). 2005.068.01 is only available from the Battle of Trafalgar Prestige Book (DX35). 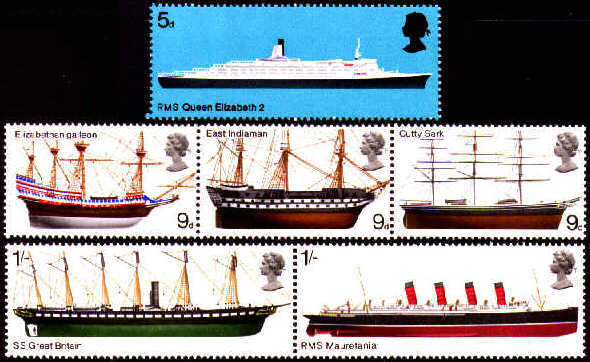 SG changes it's numbering system for Self-Adhesive (S/A) stamps such as the one above (and the 42p amongst others) reverting to main catalogue numbers, hence no "Y" prefix. 2002.068.02 is the generic number regardless of the booklet source. 2002.068.02a is from the Books of 6 NB1 issued 4th July 2002. 2002.068.02b is from the Books of 6 NB2 issued 28th May 2003. 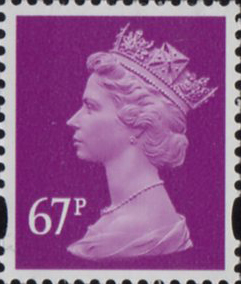 2002.068.03 has short bands (S17) clear of the perforations at the bottom of the stamps. 2002.068.04 has short bands (S16) clear of the perforations at the top of the stamps. 2011.068.01 no source code. Date M11L. T2a cuts. 2012.068.01 no source code. Date M12L.